Introducing our advanced auger pump technology: the Precision Auger Pump. This pump design provides your process development with a broad range of functionality. It is compatible with an extensive range of auger/cartridge assemblies. The Precision Auger Pump works with mid-to-high viscosity fluids such as glues, conductive and non-conductive adhesives, and pastes. With the introduction of our newest 062 diameter auger, this pump can repeatedly dispense solder paste for 01005 components. The Precision Auger pump also interfaces with our Real Time Process Control System (FPC) that provides a consistent fluid feed to the auger/cartridge assembly rather than a constant supply of reservoir pressure. FPC improves dispense repeatability over the full range reservoirs. When using large reservoirs, like a 6 oz cartridge, we recommend using the FPC system. The Precision Auger Pump can be programmed for many different aspects including acceleration, deceleration, speed, and in the case of dots, an exact amount of rotation. A servo motor and a high-resolution, precision encoder control the pump. Using the motion system to control the pump ensures repeatable operation and uniform speed when fluid viscosity changes. An optional body heater is available to assist with stabilizing fluid viscosity. The auger/cartridge assemblies for the Precision Auger Pump are made from carbide. They withstand abrasive fluids for long-life operation. To accommodate the wide variety of applications for which the Precision Auger pump is suited, a range of auger diameters and cuts are available. The selection of auger diameter and cut are based on specific application requirements, dispense quantity, and dispense rate. Any auger/cartridge configuration can be inserted into the main Precision Auger Body without modification. A single pump can process a broad range of applications. More about Precision Auger/Cartridge assemblies. The standard gap between the auger and cartridge wall is 0.0003" (7 µm). 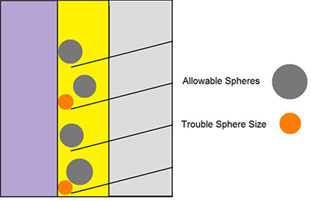 High tolerances are set to avoid spheres of solder and other particles from shearing between the auger and cartridge wall. 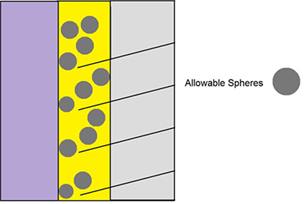 When particles shear, undesirable results can occur: particles deform and clog the nozzle or accumulate on the cartridge wall and lead to binding. Additionally, the shearing effect can cause excessive wear. To accommodate fillers, the auger is customized or relieved. The relief allows fillers to float between the auger and cartridge wall, avoiding the shearing/binding effect. The needs of our customers are always our first priority. We work with our customers to customize the specifications they require. 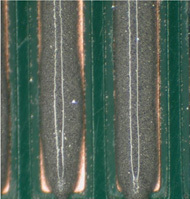 Dispense of a solder paste with an incorrect auger configuration. 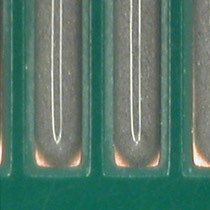 Dispense of a solder paste with optimized auger configuration. Fluid is delivered to a substrate by precision nozzles designed for maximum flow rate. At the nozzle entrance, a larger than normal diameter catches the fluid and delivers it through the length of the tube to the desired ID. This design significantly reduces pressure build-up and improves flow rate. Nozzle sizes are available for most common gauge sizes starting at 13 G. Standard needles are made of steel for long life. For special applications, ceramic is available. Ceramic offers lower friction rates, enhancing the flow of some dispense fluids. An adapter for luer nozzles is available for applications where a disposable needle is preferred. More about precision nozzles. Improve dispense results for high viscosity fluids with our heated configuration of the Precision Auger pump. The optional heated pump body assists with stabilizing fluid viscosity. Pump body heating is available up to 130°C. The cartridge assembly is machined from copper for uniform heat distribution. A syringe heater is available for dense fluids that may take extra time to heat. This reservoir heater is compatible with most GPD Global dispense pumps. 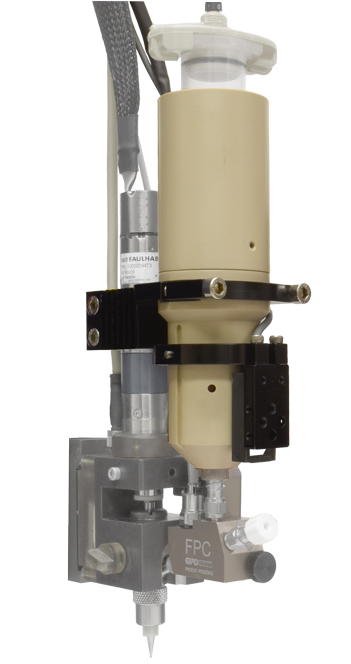 The Precision Auger Pump can be integrated into your existing dispensing system. More about pump integration. Are you an existing customer? Upgrade your current pump with this new advanced body pump solution. Cleaning the Precision Auger pump is EASY. Further reduce the typical ten minutes required to clean the pump by using an ultrasonic cleaner. 1. Remove cartridge from pump body. 3. Remove auger from cartridge. 6. Lubricate the auger collar.